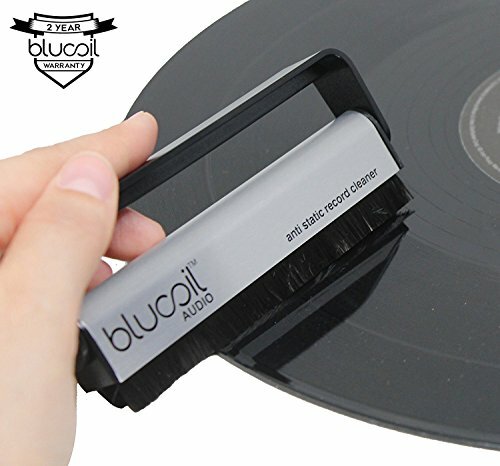 For all the music lovers who love listening to music and keep playing records on repeat, if you are willing to extend the life of your vinyl we have a solution for you, the Blucoil Anti-Static Record Cleaner Brush. This brush is designed to remove dirt, dust, and grit embedded into the grooves of your vinyl. The brush consists of a metal handle with super fine carbon fibers that gently remove the dirt that would cause snaps, crackles, and pops in your speakers and increases the life of your products. Keeping the records clean and dust free reduce surface noise. Regular cleaning (recommended after every use) would reduce static that will not accumulate dust to the surface. An important thing in maintaining the quality of the brush is it must always be kept clean. Just place the record on your turntable and fire it up. As it rotates, gently place the brush on the vinyl and let it do its thing. After a few rotations, pull it off and clean the brush. Use the dry brush to brush off the speakers to gently remove dust and static charge to ensure the sound of the speaker is not compromised. TRULY ANTI-STATIC: This record cleaning brush is electrically conductive preventing any static charges and keeping the dust particles away. INCREASE LIFETIME OF CARTRIDGE: Cleaning your records often and keeping the dust particles away increases the lifetime of your player's cartridge. With reduced surface loss you can improve your listening experience. CONVENIENT TO CARRY AND STORE: The 360 degree feature helps you fold your brush. You can easily store it or carry with you anywhere. TWO-YEAR WARRANTY: This high quality vinyl record cleaner is made to last and comes with a two-year warranty.